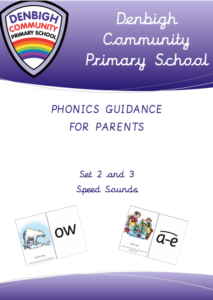 The information in this booklet will explain the phonics teaching that your son / daughter will receive daily at school during their formative reading years. It also provides information on how you can help support your son’s / daughter’s phonics development at home. If you need clarification or would like to know more about our phonics teaching, please make an appointment to speak to your son’s /daughter’s class teacher. In Reception at Denbigh we use lots of different strategies to teach the children phonics. As the children learn a range of letter sounds we start to blend them together to read words and to segment them to write them. As children get more confident writing short words we start writing some sentences. We do this in lots of different ways that support the children develop the skills they need to write independently. Some parents have told us that they found it useful to see some of things we do everyday, so they can support at home. The following videos show a selection of strategies that we use when teaching phonics and early writing skills with your child.